Flows of molten metal can generate magnetic fields. This so-called dynamo effect creates cosmic magnetic fields, like those found on planets, moons and even asteroids. Over the coming years, a globally unique experiment, in which a steel drum containing several tons of liquid sodium rotates around two axes, is intended to demonstrate this effect. It will be carried out in the new DRESDYN facility at the Helmholtz-Zentrum Dresden-Rossendorf (HZDR), an independent German research laboratory. A recently published study in the scientific journal Physical Review Letters confirms the experiment's chances of success. Similarly to how a bicycle dynamo converts motion into electricity, moving conductive fluids can generate magnetic fields. The so-called magnetic Reynolds number (the product of the fluid's flow velocity, expansion and conductivity) primarily determines whether a magnetic field is actually generated. During a spectacular experiment, scientists in Frank Stefani's team at the HZDR's Institute of Fluid Dynamics aim to achieve the critical value required for the occurrence of the dynamo effect. For this purpose, a two-meter diameter steel cylinder containing eight tons of liquid sodium will rotate around one axis up to ten times per second and once per second around another, which is tilted with respect to the first. The technical term for this movement, which is often compared to a tilted spinning top, is precession. "Our experiment at the new DRESDYN facility is intended to demonstrate that precession, as a natural driver of flow, is sufficient to create a magnetic field," says André Giesecke, lead author of the study. In his simulations and during accompanying water experiments – the mock-up was six times smaller than the large dynamo – scientists examined the structure of precession-driven flow. "To our surprise, we observed a symmetrical double role structure in a specific range of the precession rate, which should provide a dynamo effect at a magnetic Reynolds number of 430," says the physicist. The center of the Earth consists of a solid core surrounded by a layer of molten iron. "The molten metal induces an electric current, which in turn generates a magnetic field," explains Giesecke. The common belief is that buoyancy-driven convection, together with Earth's rotation, is responsible for this geodynamo. However, the role played by precession in the formation of Earth's magnetic field is still completely unclear. The Earth's rotational axis is tilted by 23.5 degrees from its orbital plane. The rotational axis changes position over a period of approximately 26,000 years. This precessing motion through space is thought to be one of the possible sources of energy for the geodynamo. Millions of years ago, the Moon also had a powerful magnetic field, as indicated by rock samples from the Apollo missions. According to experts, precession could have been the main cause of this. 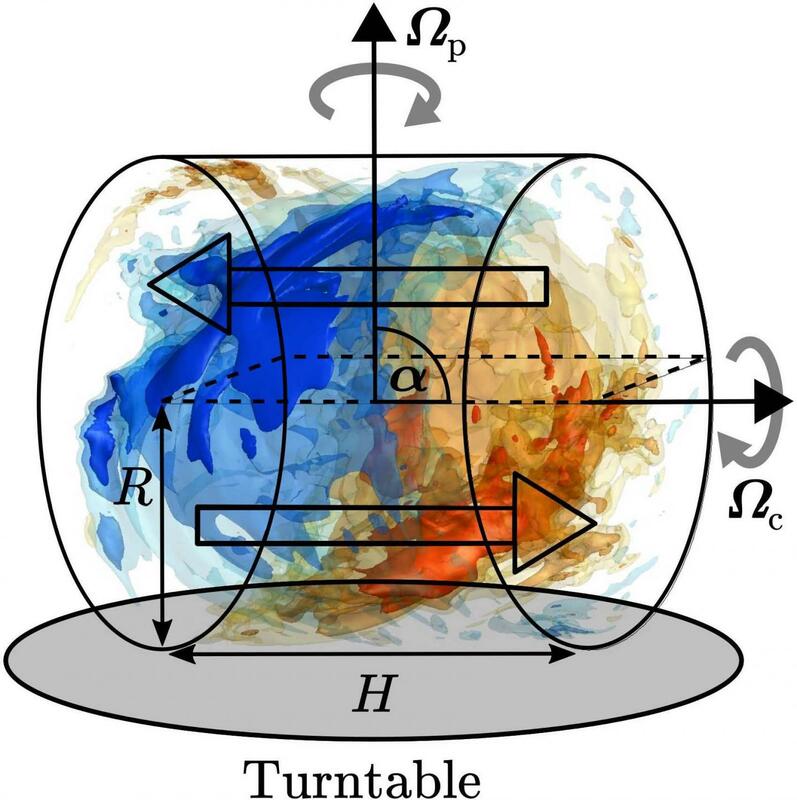 "In simulations, we discovered that stationary inertia waves occur in a wide parameter range. Within a certain range, however, we have now noticed a characteristic double role structure that proves to be extremely efficient for the dynamo effect. In principle, we are already aware of such a velocity structure thanks to the French dynamo experiment, in which it was artificially produced by two propellers, while in our precession experiment it should emerge naturally." The scientific community involved with dynamos is eagerly awaiting the results of the planned experiment, which will operate at the limits of technical feasibility in many respects. "We also expect detailed insights into the general dynamics of liquid metal flows under the influence of magnetic fields. This will allow us to draw conclusions about flows in the industrial sector," according to Giesecke. And last but not least, the magnetic flow tomography developed at the HZDR as part of its dynamo research is of interest to many areas of steel casting and crystal growing. The work has been partially funded by the Helmholtz Alliance "Liquid Metal Technologies" (LIMTECH).